Happy Anniversary, Dear Readers! Can you believe that we’re already entering our second year of Every Food Fits? We thought it best to begin year two the same way we began the blog – with homage to chocolate. For our new readers, the idea for this blog came from the desire of likeminded friends and colleagues – Samantha Lewandowski, a registered dietitian, and Stacey Viera, a communicator and photographer – to work together. Sam and Stacey’s mutual love of food – cooking it, eating it, sharing it – was the catalyst for this weekly web log. We hope that you enjoy the mouth-watering photography, prep ideas and sensible nutrition tips we bring to you every Thursday. The best part about the nutrition info and recipe ideas we’ll share? You can enjoy them all guilt free. Remember: Every Food Fits. Without further ado: CHOCOLATE. If you didn’t read our inaugural post from last year, here’s a refresher. Yes, chocolate is still touted for its health benefits, so for those of us who love it in all forms, this is excellent news. Even the Cleveland Clinic has some advice on being choosy about your chocolate to reap the antioxidant benefits. Okay, so these cookies don’t contain the antioxidant rich dark chocolate, but they would be a decadent treat for Valentine’s dessert! We’d love to hear how you are incorporating or substituting dark chocolate for the standby semi sweet and milk chocolate, in baking or other treats. Does the health information related to dark chocolate change your mind when it comes to indulging? 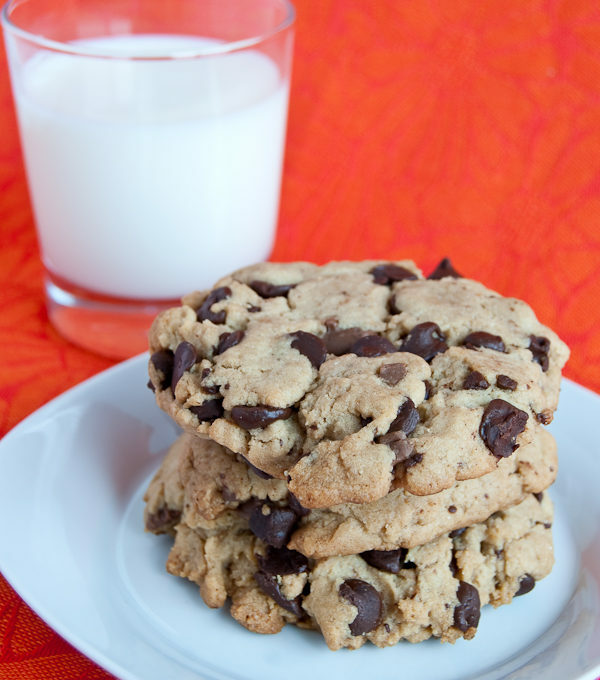 When we served these Chocolate Chip Peanut Butter Cookies, one of our taste testers said, “Wow, I want two!” He bit into the first one and said, “Oh. I think I can only handle one.” That is to say, this is a very rich recipe. The basis of the recipe is from Everyday Food Magazine, but of course we modified it. Preheat oven to 350. Whisk 1 ½ cups all-purpose flour and 1 tsp. baking soda in a bowl and set aside. With an electric mixer, beat 1 cup peanut butter, 4 tbsp. unsalted butter at room temperature, ½ cup brown sugar and ½ cup granulated sugar until light and fluffy. Add 2 large eggs, 1 tsp. pure vanilla extract and beat until smooth. Add flour mixture and beat gradually until combined. Stir in ½ cup semi-sweet chocolate chips and ½ cup chopped Reese’s Peanut Butter Cups. 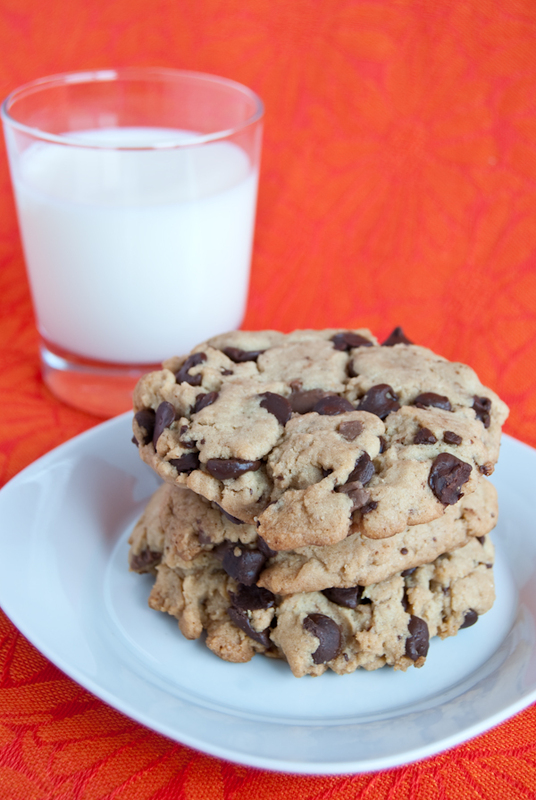 Drop dough onto large baking sheet – we used a Silpat – with about 1 inch between cookies. Bake 13-15 minutes, rotate the sheet halfway through for even browning. Makes about a couple dozen cookies. NOTE: We can neither confirm nor deny that more Reese’s Cups were added to the batter and our bellies during the baking process. How Stacey Got the Shot: Natural light bounced with foam core. ISO 100, focal length 38mm, f/6.3, 1/3 second exposure.